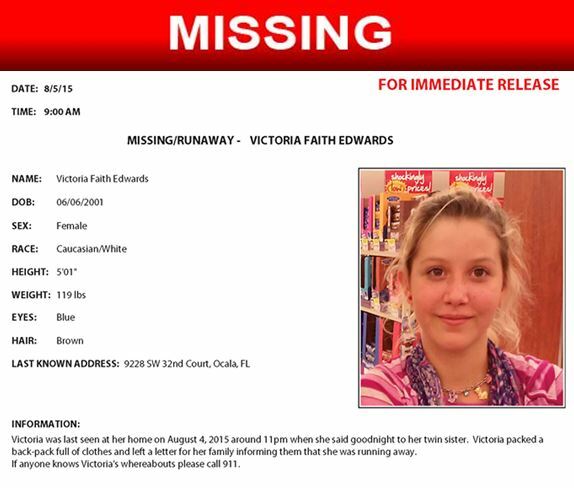 Ocala, Florida — Victoria Edwards, 14, who was last seen at her home on August 4, 2015, at approximately 11 p.m is still missing. She said goodnight to her twin sister, packed a back-pack full of clothes, and left a letter for her family informing them that she was running away. Victoria has blue eyes and brown hair. She is 5 feet 1 inch tall and weighs approximately 119 pounds. Since Victoria has not been seen or heard from for 16 days, her family and officials are concerned for her safety. If anyone knows of Victoria’s whereabouts, please call 911.